Sequence of 9 images taken March 21 UT, with a time resolution of about 15 minutes. 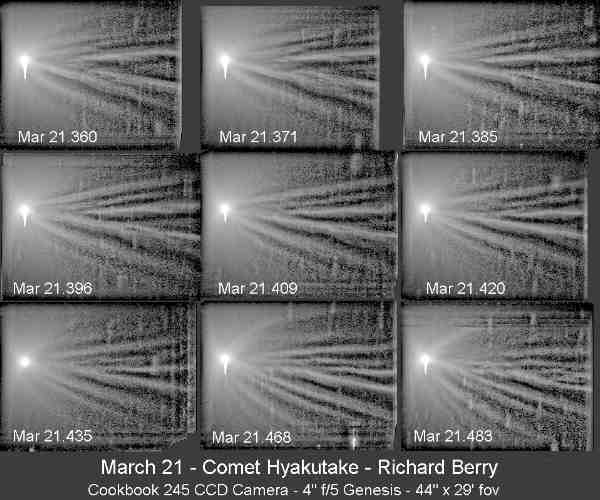 These images are highly processed to reveal low-contrast features in the tail of the comet. I shot a 60-second integration every 80 seconds using Cookbook 245 CCD on a 6"f/5, 4"f/5, or 200mm lens. I grouped the images and registered them on the comet nucleus. I then created an image from the median of these frames, which largely eliminates the "moving" stars. I then used the following process: CB245 script language: RANK 20 .8 / RANK 12 .5 / GUMA 24 1.6. This enhances low-contrast features and ignores the elliptical brightness contour that dominates the raw data. The rank process compares the brightness of a pixel with its neighbors inside a given radius. In square of radius 10, there are 441 pixels. Sort the pixels in the region into ascending order of brightness. If the pixel at the center is the 235th in brightness rank, it is assigned a value of (235/441)*4095. The "gain" of the rank process becomes higher the more uniform the region is. It best detects features roughly equal in dimension to the radius. It is insensitive to large brightness differences. To get higher time resolution, I registered all frames on the nucleus and then created a median image. I used the rank minimum function to erode details in the median image and then smoothed it with a 24-sigma Gausssian and then subtracted this from each of the data frames. This removed the gross brightness contour of the comet. I then stretched the difference, ran a big Gaussian mask over it, and saved it.